With Apple again failing to advise shareholders that chief executive Steve Jobs underwent major surgery, the New York Times has published a profile of the company's unparalleled aura of secrecy, which stems from products to personnel and everything in between. The newspaper cited Regis McKenna, a marketing veteran who advised Apple on its approach to dealing with the media back in the 80s, as saying the company's tight-lipped culture began to take shape in earnest around the release of the original Macintosh back in 1984. "It really started around trying to keep the surprise aspect to product launches, which can have a lot of power," he said, noting that rivals like Microsoft and Sony were all too familiar with plans for the first Mac long before chief executive Steve Jobs pulled back the black cloth. These days, Apple employees working on secret projects must "pass through a maze of security doors, swiping their badges again and again and finally entering a numeric code to reach their offices," a former employee who recently worked in one of these areas told the Times. Once inside these top-secret areas, employees are often monitored by surveillance cameras as they work. And those testing the most sensitive projects are instructed "to cover up devices with black cloaks when they are working on them, and turn on a red warning light when devices are unmasked so that everyone knows to be extra-careful." These measures often result in employees learning about new Apple products for the first time alongside the general public, like former systems engineer Edward Eigerman, who along with his co-workers, had no clue the company was about reinvent the music industry with the iPod until the day it launched. "No one that I worked with saw that coming," he said. According to the Times, Eigerman was fired from Apple four years ago for his role in an incident that saw one of his colleagues leak a pre-release copy of some unannounced software product to an Apple business customer as a favor. He notes that the company actively attempts to sniff out leakers and terminate their employment. Apple marketing chief Phil Schiller is said to be among the members of Apple's top brass who play an integral role in helping to track down employees who disclose advance product information to members of the press. At times, it's reported, he has held internal product briefings in which he's disseminated inaccurate details of an upcoming product's prices or features, then attempts to track down the source of news reports that print the incorrect information. The Times even recalls a widely publicized case five years ago in which Apple attempted to subpoenaed AppleInsider's Kasper Jade and the PowerPage's Jason O'Grady to force them to identify sources who provided accurate details of an unreleased hardware product code-named Asteroid. The journalists refused to cooperate and instead enlisted the services of the Electronic Frontier Foundation as their counsel. Eventually, the case went to court with Apple arguing that online journalists shouldn't be afforded the same protections as print journalists. A three-judge panel in the California Court of Appeals ultimately sided unanimously in favor Jade and O'Grady, ruling that they were indeed entitled to the same protections as conventional reporters and would not have to identify their sources. During the proceedings, the court made it clear to Apple that it had no grounds to railroad online reporters into doing their dirty work of uncovering leakers. Apple declined to appeal and EFF later sued the company for attorney's fees. The court, in an effort to deter Apple from filing future cases of little merit, awarded EFF more than two times the attorney's fees it had asked for, which resulted in Apple paying a $700,000 lump sum that went back into the firm to help defend others who may unjustly come under the heavy hand of big corporations. 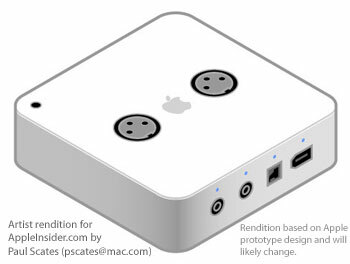 For those interested, the development of Asteroid (pictured above) —a FireWire jam box Apple intended to market alongside its Garage Band software —was later terminated due to "poor initial execution," according to a person familiar with the matter. Apple now employs alternative measures in its attempts to keep product plans secret, such as filtering out leakers internally through an in-house information securities division or intentionally misleading Wall Street analysts who, like journalists, attempt to predict the company's next moves in research notes to their paying clients. Gene Munster, an analyst for Piper Jaffray frequently cited by AppleInsider, told the Times that he often "jokes with other colleagues covering the company about how Apple routinely 'jams the frequencies,' or gives them misinformation to deter them for zeroing in on details of future products or directions it hopes to keep confidential. For example, Munster said that four years ago he was told flat out by an Apple executive that the company saw no interest in developing a budget iPod that lacked a display screen. A few months later, the iPod shuffle was introduced at Macworld Expo. But Apple's veil of secrecy covers more than just products. It extends to the company's executives, a matter which is now coming under increased scrutiny given recent reports that Steve Jobs underwent a second major surgery without disclosing such information to shareholders who believe he's vital to the continued success of the company and the strength of its share price. At issue is whether Apple legally sidestepped the responsibility of having to disclose Jobs' recent liver transplant by placing him on leave and shifting the day-to-day responsibilities to chief operating officer Tim Cook. Some governance experts cited by the Times say that while this may indeed by the case, the fact that Jobs required major surgery such as a liver transplant "now makes one of Apples assertions from January  that Mr. Jobs was suffering only from a hormonal imbalance  seem like a deliberate mistruth, unless Mr. Jobss health condition suddenly deteriorated." "Of course, no one knows enough to say definitively," the Times said.